That's a beautiful sampler and you've got me hooked on Vintage Lt Exampler too! Enjoy and have a safe trip home! Great Start! And it is very surprising that you chose Vintage Lt. Exemplar :) LOL! What a beautiful sampler. I always enjoy visiting your blog just to see what you've been stitching on! Another one I'm interested in seeing you do. The fabric choice should be nice for it. Enjoy! This is such a pretty sampler. Have fun stitching it! That's a gorgeous sampler and perfect for a new year start. I look forward to seeing your progress on this one! 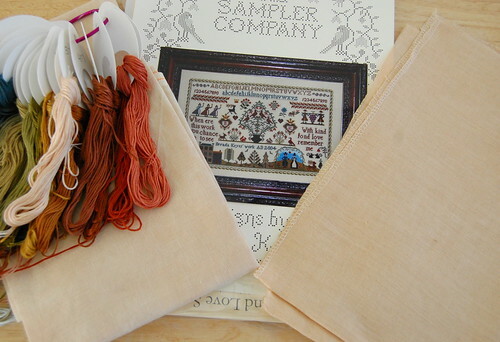 Such a pretty sampler! I know you are going to love it when it's done. I'm liking the vintage samplers--you may be influencing me!!! 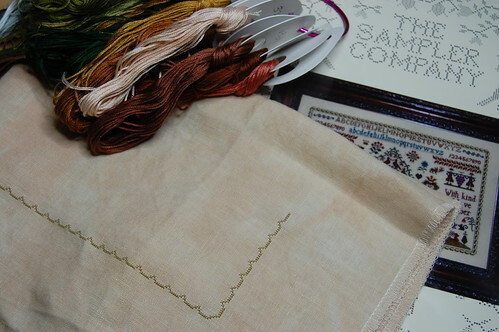 Looking forward to seeing your progress on this lovely sampler! Love the linen! This is going to be a good one, Nicole. I'm also not surprised by the fabric, although I thought your hand-dyed fabric was so very close in color! You really do a great job of dyeing fabrics. Sending love and hugs and a safe trip home with the boys! Great start on a beautiful sampler on a lovely fabric! Great start! Looking forward to seeing your progress! That's a really pretty sampler - have fun with it! Happy New Year Nicole. A lovely start on the sampler. Ciao volevo farti i complimenti per i tuoi bellissili lavori.Affettuosamente Milena A. Great choice and start!! Can't wait to see this progress! I love visiting your blog Nicole, to see your great stitching and your beautiful pictures.